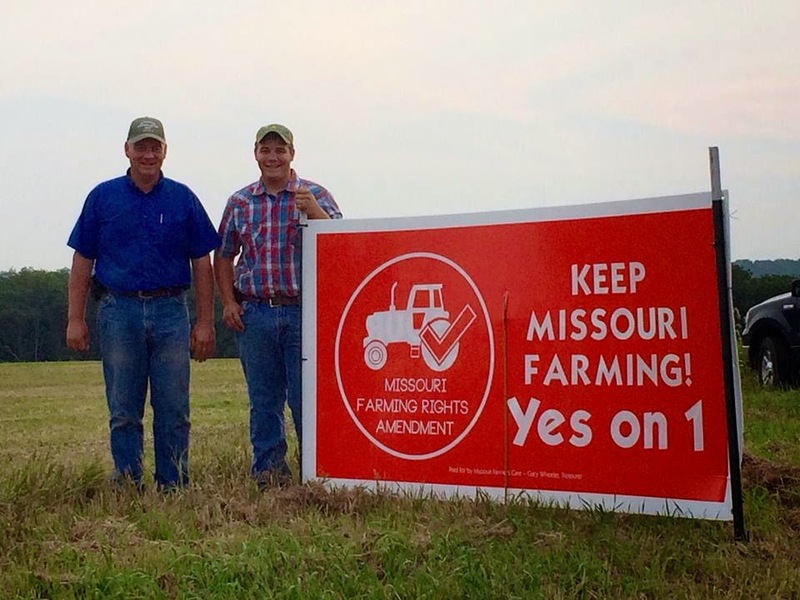 "Keep Missouri Farming--Vote YES on Amendment 1" -- Program presented by Senator Mike Parson at Lafayette County Republicans' Summer Picnic on July 10th at LaBella Winery. Missouri Senator Mike Parson (R-District 28) discussed the “Protecting the Right to Farm Amendment” July 10th at Lafayette County Republicans summer picnic at LaBella Winery, near Wellington. The measure will be on the August 5th ballot, and Senator Parson shared how agriculture is being threatened in Missouri with misinformation concerning the ballot question and about other agricultural issues. Senator David Pearce (21st Senatorial District) introduced Senator Parson. Local candidates in attendance spoke briefly to the group. They included: Rep. Glen Kolkmeyer (53rd Legislative District) who is running for re-election; Jacob Turk who is running for U.S. Congressman from the 5th Congressional District; Russell Kruse, candidate for Associate Circuit Judge, Division 2; Kelly Halford Rose, candidate for Associate Circuit Judge, Division 3; Harold Hoflander, Presiding Commissioner running for re-election; Linda Niendick, County Clerk running for re-election; Deana Aversman, Circuit Clerk running for re-election; Cherie Mason, Auditor, running for re-election; and primary candidates running for Recorder of Deeds, JoAnn Swartz and Penny Grosso. Patsy Olvera, Recorder, is retiring after 32 years of service and also spoke to the group. Special guests included past State Senator Bill Stouffer, past State Representative Mike McGhee, and past Presiding Commissioner Jim Strotdman. Lana Crain, president of the Federated Republican Women of Lafayette County, introduced Marlene Strodtman who gave the table prayer and Linda Niendick, County Clerk, who led the group in the Pledge of Allegiance. Emily Kolkmeyer Wilson baked and decorated a special "Keep Missouri Farming" cake for the event. Continue to check here for future Republican events in Lafayette County. And don't forget to vote in the August 5th primary election!